Explore how climate change is affecting coastal zones. James E. Neumann, Industrial Economics, Inc. 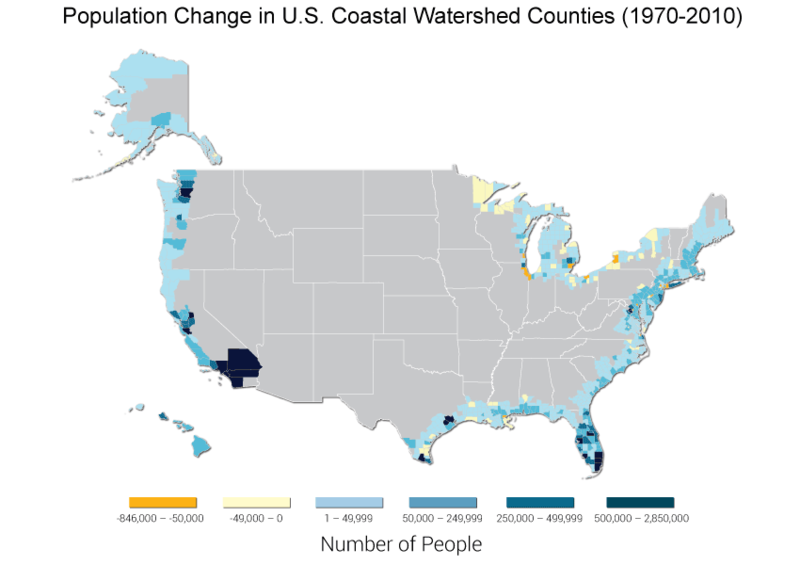 Figure 25.1: U.S. population growth in coastal watershed counties has been most significant over the past 40 years in urban centers such as Puget Sound, San Francisco Bay, southern California, Houston, South Florida and the northeast metropolitan corridor. A coastal watershed county is defined as one where either 1) at a minimum, 15% of the county’s total land area is located within a coastal watershed, or 2) a portion of or an entire county accounts for at least 15% of a coastal USGS 8-digit cataloging unit.285 Residents in these coastal areas can be considered “the U.S. population that most directly affects the coast.”285 We use this definition of “coastal” throughout the chapter unless otherwise specified. (Data from U.S. Census Bureau). Meanwhile, public agencies and officials are charged with balancing the needs of economic vitality and public safety, while sustaining the built and natural environments in the face of risks from well-known natural hazards such as storms, flooding, and erosion.291 Although these risks play out in different ways along the United States’ more than 94,000 miles of coastline,292 all coasts share one simple fact: no other region concentrates so many people and so much economic activity on so little land, while also being so relentlessly affected by the sometimes violent interactions of land, sea, and air. Humans have heavily altered the coastal environment through development, changes in land use, and overexploitation of resources. Now, the changing climate is imposing additional stresses,293 making life on the coast more challenging (Figure 25.2). The consequences will ripple through the entire nation, which depends on the productivity and vitality of coastal regions. Events like Superstorm Sandy in 2012 have illustrated that public safety and human well-being become jeopardized by the disruption of crucial lifelines, such as water, energy, and evacuation routes. As climate continues to change, repeated disruption of lives, infrastructure functions, and nationally and internationally important economic activities will pose intolerable burdens on people who are already most vulnerable and aggravate existing impacts on valuable and irreplaceable natural systems. Planning long-term for these changes, while balancing different and often competing demands, are vexing challenges for decision-makers (Ch. 26: Decision Support). Sea surface temperatures are rising9,10 and are expected to rise faster over the next few decades,11 with significant regional variation, and with the possibility for more intense hurricanes as oceans warm (Ch. 2: Our Changing Climate). Patterns of precipitation change are affecting coastal areas in complex ways (Ch. 2: Our Changing Climate). In regions where precipitation increases, coastal areas will see heavier runoff from inland areas, with the already observed trend toward more intense rainfall events continuing to increase the risk of extreme runoff and flooding. Where precipitation is expected to decline and droughts to increase, freshwater inflows to the coast will be reduced (Ch. 3: Water). There has been an overall increase in storm activity near the Northeast and Northwest coastlines since about 1980.27 Winter storms have increased slightly in frequency and intensity and their storm tracks have shifted northward.28,29 The most intense tropical storms have increased in intensity in the last few decades.30 Future projections suggest increases in hurricane rainfall and intensity (with a greater number of the strongest – Category 4 and 5 – hurricanes), a slight decrease in the frequency of tropical cyclones, and possible shifts in storm tracks, though the details remain uncertain (Ch. 2: Our Changing Climate). Newtok, AK, is relocating away from the eroding shoreline. Summer sea ice is receding rapidly, altering marine ecosystems, allowing for greater ship access and offshore development, and making Native communities highly susceptible to coastal erosion. Ice loss from melting Alaskan and Canadian glaciers currently contributes almost as much to sea level rise as does melting of the Greenland Ice Sheet. Current and projected increases in Alaska’s ocean temperatures and changes in ocean chemistry are expected to alter the distribution and productivity of Alaska’s marine fisheries. San Diego Bay engaged in a multi-sector, multi-level stakeholder process to develop a first adaptation plan. California Ocean Protection Council developed sea level rise guidance for state and local governments. Bay Conservation and Development Commission passed Bay Plan Amendment. Sea level has risen approximately 7 inches from 1900 to 2005, and is expected to rise at growing rates in this century. Higher temperatures; changes in precipitation, runoff and water supplies; and saltwater intrusion into coastal aquifers will result in negative impacts on coastal water resources. Coastal storm surges are expected to be higher due to increases in sea level alone, and more intense persistent storm tracks (atmospheric river systems) will increase coastal flooding risks from inland runoff. Expensive coastal development, critical infrastructure, and valuable coastal wetlands are at growing risk from coastal erosion, temporary flooding, and permanent inundation. The San Francisco Bay and San Joaquin/Sacramento River Delta are particularly vulnerable to sea level rise and changes in salinity, temperature, and runoff; endangering one of the ecological “jewels” of the West Coast, growing development, and crucial water infrastructure. Wisconsin’s state adaptation plan includes emphasis on lake shorefront areas. Bay-Lake Regional Planning Commission updated hazard mitigation plans. Ohio’s Lake Erie Commission is in the process of developing model shoreline development legislation. Higher temperatures and longer growing seasons in the Great Lakes region favor production of blue-green and toxic algae that can harm fish, water quality, habitat, and aesthetics. Increased winter air temperatures will lead to decreased Great Lakes ice cover, making shorelines more susceptible to erosion and flooding. Current projections of lake level changes are uncertain. Mississippi – Coastal Improvements Program includes buy-outs and relocation. 2012 Louisiana Coastal Master Plan ambitiously aims to protect and restore low-lying land. Entergy, America’s Wetland Foundation, and Oxfam champion joint adaptation planning for America’s Energy Coast. Hurricanes, land subsidence, sea level rise, and erosion already pose great risks to Gulf Coast areas, placing homes, critical infrastructure, and people at risk, and causing permanent land loss. Coastal inland and water temperatures are expected to rise; coastal inland areas are expected to become drier. There is still uncertainty about future frequency and intensity of Gulf of Mexico hurricanes but sea level rise will increase storm surges. The Florida Keys, South Florida, and coastal Louisiana are particularly vulnerable to additional sea level rise and saltwater intrusion. Researchers map sea level rise in Honolulu to help communities assess risks. USGS helps monitor saltwater intrusion on Majuro Atoll, Marshall Islands. Warmer and drier conditions will reduce freshwater supplies on many Pacific Islands, especially on low lying islands and atolls. 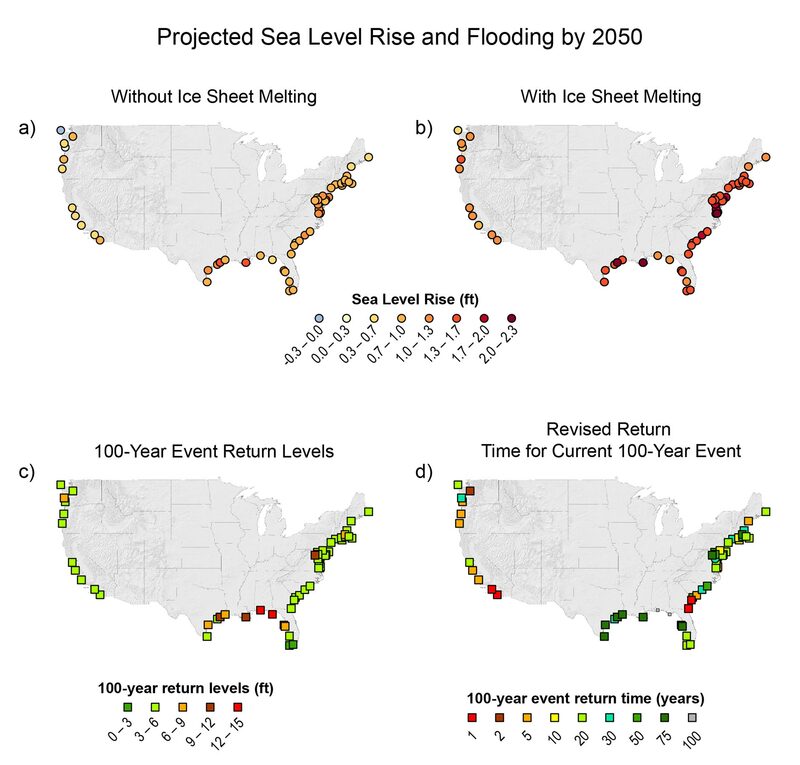 Sea level rise will continue at accelerating rates, exacerbating coastal erosion, damaging infrastructure and agriculture, reducing critical habitat, and threatening shallow coral reef systems. Extreme water levels occur when high tides combine with interannual and interdecadal sea level variations (such as ENSO, PDO, mesoscale eddy events) and storm surge. Coral reef changes pose threats to communities, cultures, and ecosystems. Delaware launched a multi-faceted effort to prepare coastal communities for sea level rise. Maryland’s Comprehensive Strategy for Reducing Vulnerability to Climate Change has a strong initial focus on sea level rise and coastal hazards. The Hampton Roads area, including the City of Norfolk, Virgina, is working to reduce recurrent flooding and impacts on coastal infrastructrure. Rates of local sea level rise in the Chesapeake Bay are greater than the global average. Sea level rise and related flooding and erosion threaten coastal homes, infrastructure, and commercial development, including ports. Chesapeake Bay ecosystems are already heavily degraded, making them more vulnerable to climate-related impacts. Portland, ME, is assessing costs for retrofitting its wastewater infrastructure. New Hampshire’s Coastal Adaptation Workgroup is providing education, guidance, and networking for local planners. City of Boston considers adaptation and mitigation equal priorities, and sea level rise is a top concern. Connecticut State Assembly amended the state’s Coastal Management Act to promote adaptation to sea level rise. Highly built-up coastal corridor concentrates population and supporting infrastructure. Storm surges from nor’easters and hurricanes can cause significant damage. The historical rate of relative sea level rise varies across the region. Wetlands and estuaries are vulnerable to inundation from sea level rise; buildings and infrastructure are most vulnerable to higher storm surges as sea level rises. Swinomish Tribe’s Climate Change Initiative highlights special challenges of coastal tribes. Oregon Sea Grant surveyed its coastal professionals on preparedness for local climate change impacts. The substantial global sea level rise is regionally moderated by the continuing uplift of land, with few exceptions, such as the Seattle area and central Oregon. Commercial shellfish populations are at risk from ocean acidification. The region’s relatively high economic dependence on commercial fisheries makes it sensitive to climate change impacts on marine species and ecosystems and related coastal ecosystems. NC Department of Transportation is raising the road bed of US Highway 64 to account for future sea level rise. The City of Charleston upgraded stormwater pumps and sewer systems to reduce tidal flooding. Charlotte Harbor National Estuary Program and City of Punta Gorda, FL, involved community stakeholders in its adaptation planning process. Southeast Florida Regional Climate Change Compact designated Adaptation Action Areas. A large number of cities, critical infrastructure, and water supplies are at low elevations and exposed to sea level rise, in some places moderated by land uplift. Ecosystems of the Southeast are vulnerable to loss from relative sea level rise, especially tidal marshes and swamps. Sea level rise will affect coastal agriculture through higher storm surges, saltwater intrusion, and impacts on freshwater supplies. The number of land-falling tropical storms may decline, reducing important rainfall. The incidence of harmful algal blooms is expected to increase with climate change, as are health problems previously uncommon in the region. Coastal lifelines, such as water supply and energy infrastructure and evacuation routes, are increasingly vulnerable to higher sea levels and storm surges, inland flooding, erosion, and other climate-related changes. A central component of the assessment process was a Chapter Lead Authors meeting held in St. Louis, Missouri in April 2012. The key messages were initially developed at this meeting. Key vulnerabilities were operationally defined as those challenges that can fundamentally undermine the functioning of human and natural coastal systems. They arise when these systems are highly exposed and sensitive to climate change and (given present or potential future adaptive capacities) insufficiently prepared or able to respond. The vulnerabilities that the team decided to focus on were informed by ongoing interactions of the author team with coastal managers, planners, and stakeholders, as well as a review of the existing literature. In addition, the author team conducted a thorough review of the technical input reports (TIR) and associated literature, including the coastal zone foundational TIR prepared for the National Climate Assessment (NCA).8 Chapter development was supported by numerous chapter author technical discussions via teleconference from April to June 2012. Coastal infrastructure is defined here to include buildings, roads, railroads, airports, port facilities, subways, tunnels, bridges, water supply systems, wells, sewer lines, pump stations, wastewater treatment plants, water storage and drainage systems, port facilities, energy production and transmission facilities on land and offshore, flood protection systems such as levees and seawalls, and telecommunication equipment. Lifelines are understood in the common usage of that term in hazards management. The key message and supporting text summarize extensive evidence documented in the coastal zone technical input report8 as well as a technical input report on infrastructure.44 Technical input reports (68) on a wide range of topics were also received and reviewed as part of the Federal Register Notice solicitation for public input, along with the extant scientific literature. Additional evidence is provided in other chapters on hurricanes (Ch. 2: Our Changing Climate, Key Message 8), global sea level rise (Ch. 2: Our Changing Climate, Key Message 10), water supply vulnerabilities (Ch. 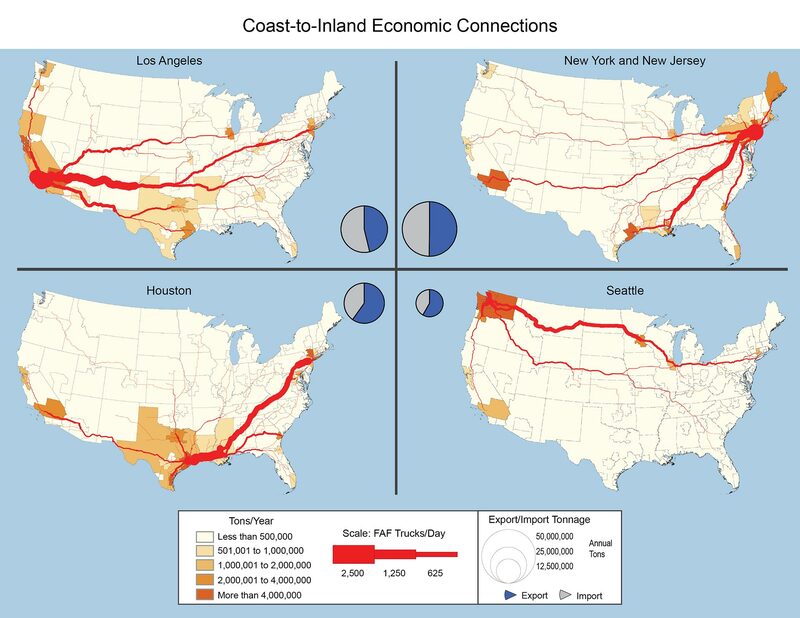 3: Water); key coastal transportation vulnerabilities (Ch. 5: Transportation), and energy-related infrastructure (Ch. 4: Energy). This key message focuses mainly on water supply and energy infrastructure and evacuation routes, as these constitute critical lifelines. The evidence base is moderate for the interaction of inland and coastal flooding. There are many and recent publications concerning impacts to wastewater treatment plants60,61,62 and drainage systems.14,30,45,63,64,65,66 These impacts lead to increased risk of urban flooding and disruption of essential services to urban residents. The timely implementation and efficacy of adaptation measures, including planned retreat, in mitigating damages is accounted for in the underlying literature (for example, by varying assumptions about the timing of implementation of adaptation measures and the type of adaptation measures) such as hard protection, elevation, relocation, or protection through wetlands and dunes in front of the infrastructure in question) (for example, Aerts and Botzen 2012; Biging et al. 2012; Bloetscher et al. 2011; Heberger et al. 2009; Irish et al. 2010; Kirshen et al. 201114,41,68,69,70,60). However, such studies can only test the sensitivity of conclusions to these assumptions; they do not allow statements about what is occurring on the ground. Additional uncertainties arise from the confluence of climate change impacts from the inland and ocean side, which have yet to be studied in an integrated fashion across different coastal regions of the United States. 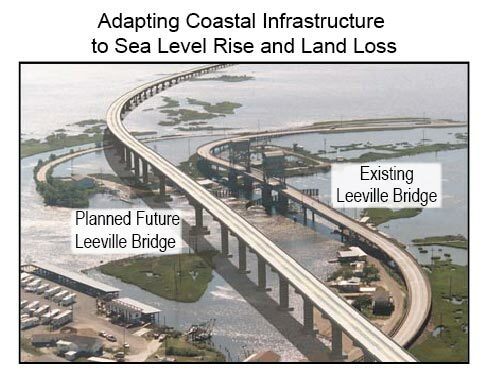 Given the evidence base, the large quantity of infrastructure (water-related infrastructure, energy infrastructure, and the 60,000 miles of coastal roads) in the U.S. coastal zone, and the directional trend at least of sea level rise and runoff associated with heavy precipitation events, we have very high confidence that these types of infrastructure in the coastal zone are increasingly vulnerable. Key coastal vulnerabilities arise from complex interactions among climate change and other physical, human, and ecological factors. These vulnerabilities have the potential to fundamentally alter life at the coast and disrupt coast-dependent economic activities. NOAA’s Critical Facilities Flood Exposure Tool provides an initial assessment of the risk to a community’s critical facilities and roads within the “100-year” flood zone established by the Federal Emergency Management Agency (FEMA) (the 100-year flood zone is the areal extent of a flood that has a 1% chance of occurring or being exceeded in any given year). The tool helps coastal managers quickly learn which facilities may be at risk – providing information that can be used to increase flood risk awareness and to inform a more detailed analysis and ultimately flood risk reduction measures. The critical facilities tool was initially created to assist Mississippi/Alabama Sea Grant in conducting its “Coastal Resiliency Index: A Community Self-Assessment” workshops and is now available for communities nationwide. For additional information see: www.csc.noaa.gov. Nationally important assets, such as ports, tourism, and fishing sites, in already-vulnerable coastal locations, are increasingly exposed to sea level rise and related hazards. This threatens to disrupt economic activity within coastal areas and the regions they serve and results in significant costs from protecting or moving these assets. The key message and supporting text summarize extensive evidence documented in the coastal zone technical input report.8 Technical input reports (68) on a wide range of topics were also received and reviewed as part of the Federal Register Notice solicitation for public input, as well as the extant scientific literature. Additional evidence comes from empirical observation: public statements by private sector representatives and public officials indicate high awareness of economic asset exposure and a determination to see those assets protected against an encroaching sea, even at high cost (New York City, Miami Dade County, San Francisco airport, etc.). The economic value of exposed assets and activities is frequently invoked when they get damaged or interrupted during storm events (for example, Hallegattee 2012118). Threats to economic activity are also consistently cited as important to local decision- making in the coastal context (for example, Titus et al. 2009119). Given the evidence base, the well-established accumulation of economic assets and activities in coastal areas, and the directional trend of sea level rise, we have very high confidence in the main conclusion that resources and assets that are nationally important to economic productivity are threatened by SLR and climate change. While there is currently no indication that the highest-value assets and economic activities are being abandoned in the face of sea level rise and storm impacts, we have very high confidence that the cost of protecting these assets in place will be high, and that the cost will be higher the faster sea level rises relative to land. We have very high confidence that adequate planning and arrangement for future financing mechanisms, timely implementation of hazard mitigation measures, and effective disaster response will keep the economic impacts and adaptation costs lower than if these actions are not taken. We are not able to assess timing or total cost of protecting or relocating economic assets with any confidence at this time, due to uncertainties in asset-specific elevation above sea level, in the presence and efficacy of protective measures (at present and in the future), in the feasibility of relocation in any particular case, and uncertainties in future storm surge heights and storm frequencies. In 2010, economic activity in shoreline counties accounted for approximately 66 million jobs and $3.4 trillion in wages122 through diverse industries and commerce. In many instances, economic activity is fundamentally dependent on the physical and ecological characteristics of the coast. These features provide the template for coastal economic activities, including natural protection from waves, access to beaches, flat land for port development and container storage, and wetlands that support fisheries and provide flood protection. 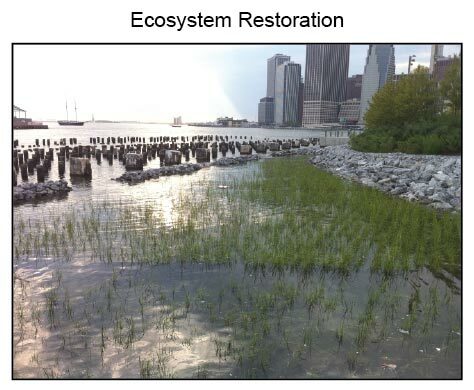 Natural shoreline protection features have some capacity to adapt to sea level rise and storms (Figure 25.6) and can also provide an array of ecosystem services benefits134 that may offset some maintenance costs. A challenge ahead is the need to integrate climate considerations (for example, temperature change and sea level rise) into coastal ecosystem restoration and conservation efforts,135 such as those underway in the Gulf of Mexico, Chesapeake Bay, and Sacramento-San Joaquin Delta, to ensure that these projects have long-term effectiveness. U.S. oceanic and Great Lakes coasts are important centers for commercial and recreational fishing due to the high productivity of coastal ecosystems. In 2009, the U.S. seafood industry supported approximately 1 million full- and part-time jobs and generated $116 billion in sales and $32 billion in income.136 Recreational fishing also contributes to the economic engine of the coasts, with some 74 million saltwater fishing trips along U.S. coasts in 2009 generating $50 billion in sales and supporting over 327,000 jobs.136 Climate change threatens to disrupt fishing operations through direct and indirect impacts to fish stocks (for example, temperature-related shifts in species ranges, changes in prey availability, and loss of coastal nursery habitat) as well as storm-related disruptions of harbor installations (Ch. 24: Oceans). The key message and supporting text summarize extensive evidence documented in the coastal zone technical input report.8 Technical input reports (68) on a wide range of topics were also received and reviewed as part of the Federal Register Notice solicitation for public input, along with the extant literature. There is an additional body of evidence emerging in the literature that also supports this key message, namely the growing literature on “barriers to adaptation,” particularly from studies conducted here in the United States.8,112,147,148,149,150 This literature reports on the limitations poorer communities face at present in beginning adaptation planning, and on the challenges virtually all communities face in prioritizing adaptation and moving from planning to implementation of adaptation options. There is empirical evidence for how difficult it is for small, less wealthy communities (for example, the Native communities in Alaska or southern Louisiana) to obtain federal funds to relocate from eroding shorelines.151,152 Eligibility criteria (positive benefit-cost ratios) make it particularly difficult for low-income communities to obtain such funds; current federal budget constraints limit the available resources to support managed retreat and relocation.153,154 The recent economic hardship has placed constraints even on the richer coastal communities in the U.S. in developing and implementing adaptation strategies, for example in California.149 While the economic situation, funding priorities, or institutional mechanisms to provide support to socially vulnerable communities will not remain static over time, there is no reliable scientific evidence for how these factors may change in the future. The body of research on this topic is largely new since the prior NCA in 2009.137 Each of the peer-reviewed studies discusses data gaps and methodological limitations, as well as the particular challenge of projecting demographic variables – a notoriously difficult undertaking – forward in time. While methods for population projections are well established (typically using housing projections), those, in turn, depend on more difficult to make assumptions about fertility, migration, household size, and travel times to urban areas. The conclusion is limited by uneven coverage of in-depth vulnerability studies; although those that do exist are consistent with and confirm the conclusions of a national study.6 This latter study was extended by applying the same approach, data sources, and methodology to regions previously not covered, thus closing important informational gaps (Hawai‘i, Alaska, the Great Lakes region). Data gaps remain for most coastal locations in the Pacific Islands, Puerto Rico, and other U.S. territories. The most important limit on understanding is the current inability to project social vulnerability forward in time. While some social variables are more easily predicted (for example, age and gender distribution) than others (for example, income distribution, ethnic composition, and linguistic abilities), the predictive capability declines the further out projections aim (beyond 2030 or 2050). Further, it is particularly difficult to project these variables in specific places subject to coastal hazards, as populations are mobile over time, and no existing model reliably predicts place-based demographics at the scale important to these analyses. Assessment of confidence based on evidence We have high confidence in this conclusion, as it is based on well-accepted techniques, replicated in several place- based case studies, and on a nationwide analysis, using reliable Census data. Consistency in insights and conclusions in these studies, and in others across regions, sectors, and nations, add to the confidence. The conclusion does involve significant projection uncertainties, however, concerning where socially vulnerable populations will be located several decades from now. Sensitivity analysis of this factor, and overall a wider research base is needed, before a higher confidence assessment can be assigned. In 2010, almost 2.8% of the U.S. population, or more than 8.6 million Americans, lived within the area subject to coastal floods that have at least a 1% chance of occurring in any one year.155,156 More than 120 million Americans live in counties that border the open ocean or Great Lakes coasts and/or have a 100-year coastal floodplain within them.156 Two trends will place even more people at risk in the future: 1) the expansion of the floodplain as sea level rises, and 2) the continuing immigration of people to coastal areas. For example, in California, an estimated 260,000 people are currently exposed to a 100-year flood; this number could increase to 480,000 by 2100 as a result of a 4.6 foot sea level rise alone (roughly equivalent to the high end of the 1 to 4 foot range of sea level rise projections, Ch.2: Our Changing Climate, Key Message 10).41 Approximately 18% of those exposed to high flood risk by the end of this century also are those who currently fall into the “high social vulnerability” category.112 This means that while many coastal property owners at the shorefront tend to be less socially vulnerable, adjacent populations just inland are often highly vulnerable. Coastal Native American and Native Alaskan people, with their traditional dependencies upon natural resources and specific land areas, exhibit unique vulnerabilities. Tribal adaptation options can be limited because tribal land boundaries are typically bordered by non-reservation lands, and climate change could force tribes to abandon traditionally important locations, certain cultural practices, and natural resources on which they depend (Ch. 12: Indigenous Peoples).170 Coastal food sources are also threatened, including salmon and shellfish. Climate change could affect other food species as well, worsening already existing health problems such as obesity, diabetes, and cancer. The degradation and depletion of coastal systems due to human stresses (for example, pollution, habitat destruction, and overharvesting) has been widely documented throughout the U.S. and the world.94,172,173,174,175,176,177 The degree of degradation varies based on location and level of human impact. However, evidence of degradation is available for all types of U.S. coastal ecosystems, from coral reefs to seagrasses and rocky shores. Human stresses can be direct (for example, habitat destruction due to dredging of bays) or indirect (for example, food web disruption due to overfishing). There is also consistent evidence that ecosystems degraded by human activities are less resilient to changes in climatic factors, such as water temperature, precipitation, and sea level rise (for example, Gedan et al. 2009; Glick et al. 2011; Williams and Grosholz 2008178,179,180). The impacts of changing coastal conditions (for example, changes associated with altered river inflows, higher temperatures, and the effects of high rates of relative sea level rise) on coastal ecosystems and their associated services have been extensively documented through observational and empirical studies, including recent publications.31,181,182,183,179,184 Many models of coastal ecosystem responses to climatic factors have been well-validated with field data. Given the existing knowledge of ecosystem responses, future climate projections, and the interactions with non-climatic stressors that further exacerbate climatic impacts, evidence is strong of the potential for further reduction and/or loss of ecosystem services. Since the 2009 NCA,137 new studies have added weight to previously established conclusions. The major advance lies in the examination of tipping points for species and entire ecosystems (for example, Barnosky et al. 2012; Folke et al. 2004; Foti et al. 2013; Hoegh-Guldberg and Bruno 2010185,194,188,190). Existing uncertainties and future research needs were identified through reviewing the NCA technical inputs and other peer-reviewed, published literature on these topics, as well as through our own identification and assessment of knowledge gaps. the potential and likelihood for irreversible climate-related coastal ecosystem change. We have very high confidence that coastal ecosystems are particularly vulnerable to climate change because they have already been dramatically altered by human stresses, as documented in extensive and conclusive evidence. We have very high confidence that climate change will result in further reduction or loss of the services that these ecosystems provide, as there is extensive and conclusive evidence related to this vulnerability. We have high confidence that climatic change will include “potentially irreversible impacts.” Site-specific evidence of potentially irreversible impacts exists in the literature. This vulnerability is frequently identified by studies of coastal ecosystems. However, methods, research, and models are still being developed for understanding, documenting, and predicting potentially irreversible impacts across all types of coastal ecosystems. Leaders and residents of coastal regions are increasingly aware of the high vulnerability of coasts to climate change and are developing plans to prepare for potential impacts on citizens, businesses, and environmental assets. Significant institutional, political, social, and economic obstacles to implementing adaptation actions remain. In addition, there is confirming evidence of very similar findings from other locations outside the U.S. (some, from Canada, were also submitted as technical input reports to the NCA), such as the United Kingdom, continental Europe, Australia, and others.230,223,224,226 New information and remaining uncertainties Adaptation is a rapidly spreading policy and planning focus across coastal America. This was not previously captured or assessed in the 2009 NCA137 and is thus a major advance in understanding, including what adaptation activities are underway, what impedes them, and how coastal stakeholders view and respond to these emerging adaptation activities. Given the local nature of adaptation (even though it frequently involves actors from all levels of government), it is difficult to systematically track, catalog, or assess progress being made on adaptation in coastal America. The difficulty, if not impossibility, of comprehensively tracking such progress has been previously acknowledged.16 This conclusion is reiterated in the Adaptation chapter (Ch. 28) of this report. While the findings and integrative key message stand on strong evidence, some uncertainties remain about U.S. coastal regions’ adaptive capacity, the level of adoption of hazard mitigation and other adaptation strategies, and the extent and importance of barriers to adaptation. We have very high confidence in this key message, as it is primarily based on studies using well-accepted social science research techniques (for example, surveys, interviews, and participant observation), replicated in several place-based case studies, and on a nationwide compilation of adaptation case studies. Consistency in insights and conclusions in these studies, and in others across regions, sectors, and nations, add to the confidence. As described above, a comprehensive catalogue of all adaptation efforts, and of related challenges and lessons learned, is difficult if not impossible to ever obtain. Nevertheless, the emerging insights and evidence from different regions of the country provide considerable confidence that the situation is reasonably well captured in the documents relied on here. The coastal stakeholders represented among the authors of the foundational technical input report8 confirmed the conclusions from their long-term experience in coastal management and direct involvement in adaptation efforts locally. Moreover, evidence from other regions outside the U.S. adds weight to the conclusions drawn here. Enacting measures that increase resilience in the face of current hazards, while reducing long-term risks due to climate change, continues to be challenging.48,220,221 This is particularly difficult in coastal flood zones that are subject to a 1% or greater chance of flooding in any given year, including those areas that experience additional hazards from wave action. According to FEMA and policy/property data maintained by the National Flood Insurance Program’s (NFIP) Bureau and Statistical Agent, nearly half of the NFIP’s repetitive flood losses occur in those areas.252,153,253 A robust finding is that the cost of inaction is 4 to 10 times greater than the cost associated with preventive hazard mitigation.111,120 Even so, prioritizing expenditures now whose benefits accrue far in the future is difficult.254 Moreover, cumulative costs to the economy of responding to sea level rise and flooding events alone could be as high as $325 billion by 2100 for 4 feet of sea level rise, with $130 billion expected to be incurred in Florida and $88 billion in the North Atlantic region.123 The projected costs associated with one foot of sea level rise by 2100 are roughly $200 billion. 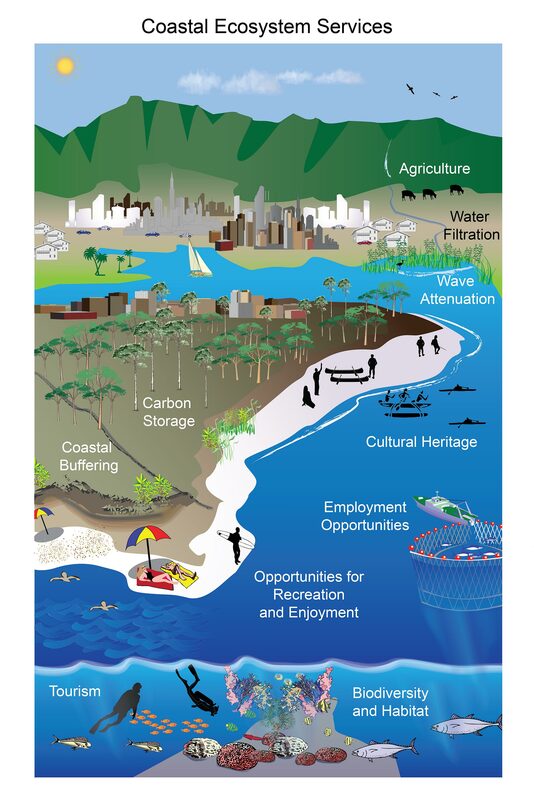 These figures only cover costs of beach nourishment, hard protective structures, and losses of inundated land and property where protection is not warranted, but exclude losses of valuable ecosystem services, as well as indirect losses from business disruption, lost economic activity, impacts on economic growth, or other non-market losses.123,255,118,256 Such indirect losses, even in regions generally well prepared for disaster events, can be substantial (in the case of Superstorm Sandy, followed by a nor’easter, in fall 2012, insured losses and wider economic damages added up to at least $65 billion).257,258 Sequences of extreme events that occur over a short period not only reduce the time available for natural and social systems to recover and for adaptation measures to be implemented, but also increase the cumulative effect of back-to-back extremes compared to the same events occurring over a longer period.221,259,260,261,262 The cost of managed retreat requires further assessment.